Use this easy vegan sour cream recipe to make the best dairy-free sour cream substitute ever! 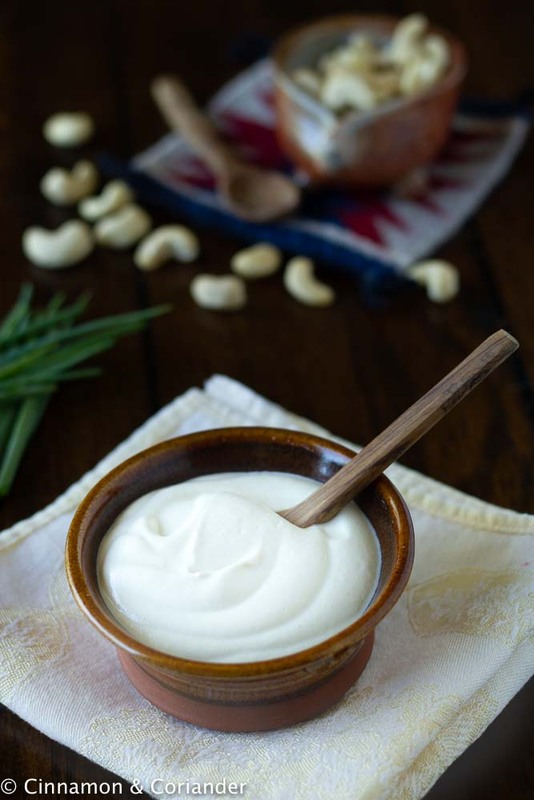 There are endless flavor variations for this dairy-free cashew sour cream and it tastes awesome as a dip, or in vegan sauces! If you’re vegan you have probably reached the point of your life, where you realize that some things just taste better with a dollop of creamy, rich and tangy cream. Good news, this easy vegan sour cream ticks all those boxes! 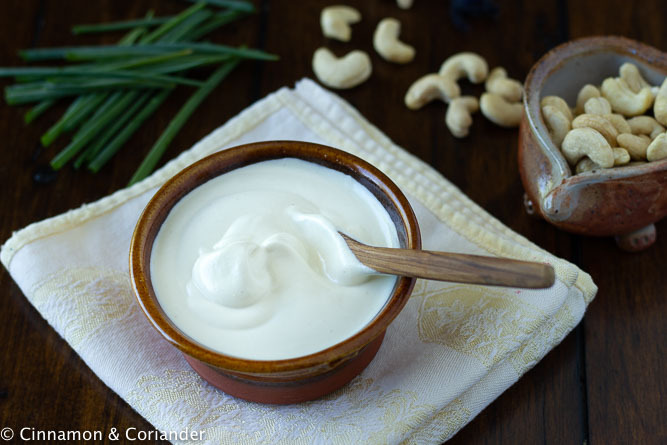 As a non-vegan, I was highly skeptic if soaked cashews can magically transform into something that resembles sour cream – both in texture and flavor. I am a total believer now! So why should a non-vegan be trusted with a vegan sour cream substitute recipe? Well, because I actually have both in the fridge and would still opt for the vegan sour cream! It’s that good! Now, I know that there are many vegan sour cream brands out there, but having tried Tofutti and the likes I would actually opt for homemade every.single.time! 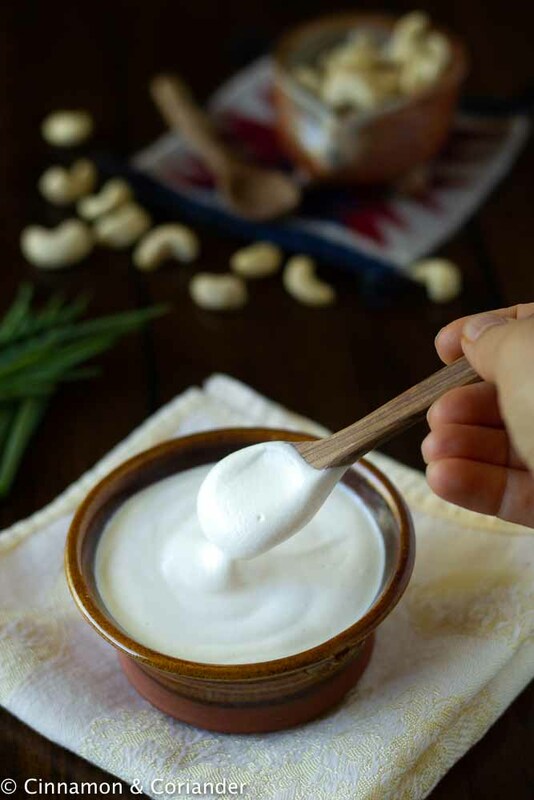 The thing is, making this vegan sour cream is fun, easy and you’ll feel a bit like a mad kitchen scientist watching your cashew nuts turn into a creamy smooth, perfectly chunk-free sour cream! Make sure you buy raw cashew nuts, not roasted and seasoned. Soak them for at least 5 hours, or even overnight. If soaking them overnight, put them in an airtight container and store in the fridge. Don’t forget to rinse them after soaking. 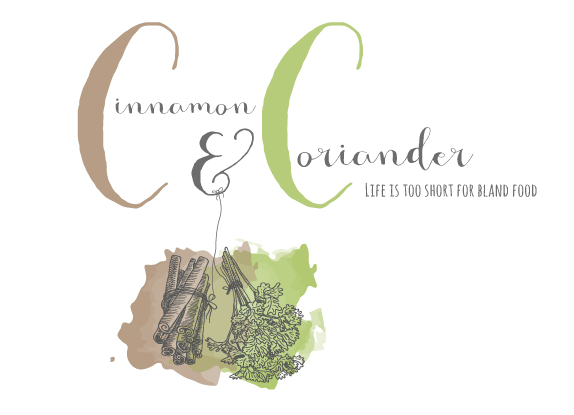 I like to use coconut milk instead of water when making this vegan sour cream recipe. It’s a personal thing, but I like it extra creamy! If you want a, you can add a tsp of maple syrup to the sour cream for a less tangy, rounder taste. For a Mexican Sour Cream, add lime juice instead of lemon juice, add some fresh lime zest, a pinch of cumin and 5 tbsp fresh cilantro leaves to the blender! This makes the best vegan nachos topping! For an autumnal sour cream, add 1 tsp pumpkin pie spice, 1 tsp vanilla and 1 tbsp of maple syrup. This is the BEST on top of morning oats or my Kabocha Squash Hummus. Make a vegan French Onion Dip: Caramelize an onion for about 20 minutes, adding a tsp of maple syrup in the end. Let cool, then blitz until finely chopped and stir into cashew sour cream. Season with 1 tsp garlic powder, 2 tbsps chopped parsley, salt, and pepper. How can I use my homemade vegan sour cream for cooking? For the oatmeal lovers out there, I love drizzling some on top of savoury oatmeal or top my sweet morning oats with my autumnal sour cream (see variations). Otherwise, think nachos dip or sauce for tacos and any other Mexican dish. I use this vegan sour cream recipe as a base for my dressing in my Vegan Creamy Cucumber Salad , I drizzle it on top of my Mujaddara and my Stuffed Acorn Squash! It’s divine! How long does Vegan Sour Cream last? The sour cream should be ok for at least 5 days or up to a week! Make sure to store it in an airtight container in the fridge. 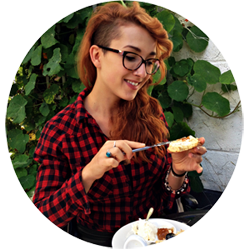 ★ Did you make and love this Easy Vegan Sour Cream Recipe? Give it your review below! And make sure to share your creations by tagging me on Instagram! 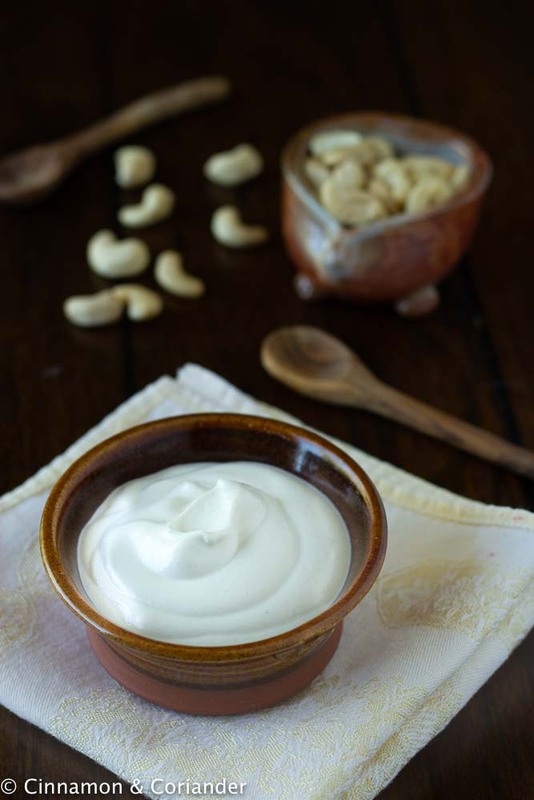 Learn how to make the best vegan sour cream using cashew nuts and a couple of secret ingredients! This easy to make dairy-free sour cream substitute tastes awesome as a dip, or in vegan sauces! Drain and rinse the soaked cashews until the water runs clear. In a high-speed blender, combine all ingredients and pulse until the mixture is super smooth and creamy. As you go, stop to scrape down the sides. If your mixture is too thick, slowly drizzle in some water, until the vegan sour cream has reached your desired consistency. Taste and add more salt or stir in some lemon zest for a zesty flavor. Transfer the sour cream to an airtight container and chill in the fridge. Leftovers keep in the fridge for about a week. As it chills, the sour cream will thicken up a bit, which you can reverse by stirring in small amounts of water or nut milk. The sour cream keeps in the fridge for about a week and will get thicker with time. Add some nut milk or water to make it thinner. For recipe variations, see blog post. 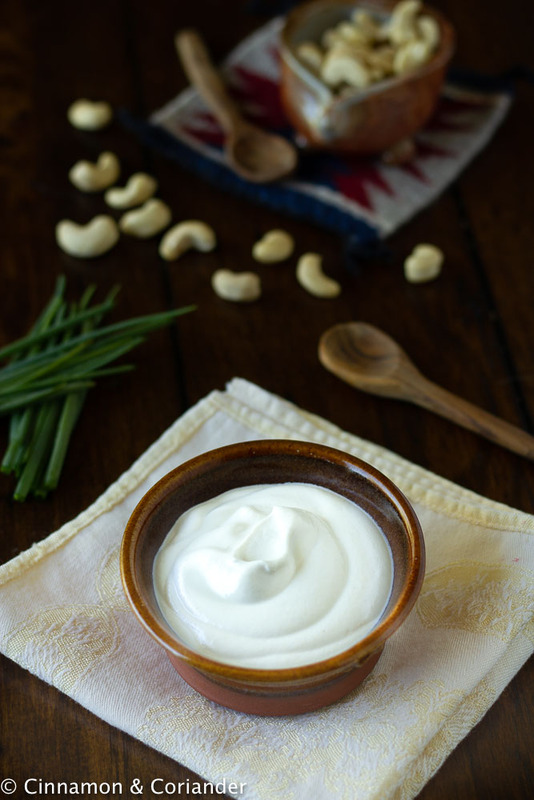 I never thought you could make sour cream from scratch, let alone from cashews! This looks so perfect and delicious, I have to try it asap! My friend just recently went vegan. I will send this over to her, so she doesn’t have to miss out. This is such an important substitution recipe for vegans! Thank you so much!!!! I have quite a few vegan friends and family members and this recipe is going to be a godsend which I’m sure I’ll enjoy every bit as much too! I’m not necessarily vegan but I would like once in a while to have Non-dairy options. And I never thought of the option of non-dairy sour cream. How amazing. I’m saving that for later. Thank you. This looks great! I’ve been wanting to try a vegan sour cream for a while now. We’ve been making our own sour cream for years. It’s quite simple but I never thought it could be made vegan. It’s really good to know. Thank you for sharing. Vegan sour cream looks exactly like regular dairy sour cream, i am surprised by the texture! Adding it to the savory oatmeal sound great! Oh my gosh, a vegan sour cream? So beautiful and how simple to make. Sharing your recipe link with my friend whose daughter is vegan. I would have never guessed that this sour cream was vegan just by looking at the pictures. It looks so creamy and delicious! And I love your suggestion for making an autumnal variation of it. Great recipe! I’m excited to try this recipe! I’ve never made regular sour cream let alone a vegan version so this will be great fun. I am going to have to share this with all my vegan friends. They don’t have to miss out on a delicious condiment now. Ha, this is genius! So simple and so healthy. I love sour cream but I don’t like dairy products so this recipe is a keeper. Saving this and I’ll give it a try.